The Conover Beacon was provided for by an act of Congress, which was approved on August 31, 1852, but it took another four years until the beacon was in operation. The original land on which the beacon sat was purchased from Rulif Conover, hence the beacon's name. That same year a beacon was erected further inland at Chapel Hill, 224 feet above sea level. Together, the beacons served as range lights, guiding ships through the narrows by way of the Chapel Hill Channel. To one with an eye for the picturesque this graceful red and white tower, 55 feet high, on a low sandy point surrounded by a ledge–a beautiful foreground against the blue sea beyond–forms a very interesting combination of effects. The original beacon was fueled with oil, but in 1924, the lamps were replaced by an electric light. 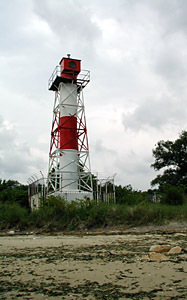 The beacon performed its duty until 1941, when it was razed and replaced by the present steel tower. The colors of the original tower were kept however. Carl Anderson was the original lights last keeper. The present tower was once the second Bayside Beacon, replacing an earlier Bayside Beacon that was taken out of service during the 1930's. The beacon was described in contemporary nautical charts as "E Int G 4sec 45 ft.," ie., Equal Interval light, group flashing, every 4 seconds on a 45 foot tower. It is located on the bay side of Leonard Avenue in Leonardo, New Jersey. It is a 45 foot tall iron with a white base, followed skyward by horizontal bands of red, white and red. The tower is tubular and supported by an external skeleton. It is currently inactive and has been handed over to the GSA for disposal.